In Colorado Springs these days, cones, detour signs, and blocked lanes have become the driving norm. In 2015, Colorado Springs taxpayers approved $50 million dollars of funding for road improvements. As a result, construction in this city is booming – especially road construction. No matter where you drive in Colorado Springs, you are likely to encounter a construction zone and those all-important orange safety cones. Slowing down in these cone zones is extremely important for the safety of everyone. But even with all the construction warning signs and cones zones people still drive too fast and construction workers are killed every year. One of the worst place for construction accidents is on I 25 and West Cimarron. Last year alone they were 158 accidents which could’ve been avoided if drivers took the time to pay attention and slow down. Distracted driving is one of the worst culprits for causing devastating cone zone road accidents. Drivers who are talking on their phones, surfing the Internet, checking social media, or texting are less likely to recognize that they are in a construction zone and are more likely to drive at a higher rate of speed. According to the Colorado Department of Transportation, 85% of work zone fatalities are motorists and occupants. 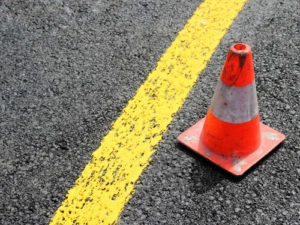 In 2011, there were 830 work zone related crashes. These resulted in 96 injuries and 10 fatalities. Tragically, many of these could have been prevented if drivers in cone zone slowed down and paid attention. Across the United States the statistics are even more shocking. Every single day 600 people die and more than 37,000 are injured in work zone crashes. And every single week, one highway worker is killed. It is always best to remember that in work zones traffic flow may be different than usual. Expect the unexpected. Normal speed limits are often reduced, traffic lanes may be blocked or changed, roads may be narrowed, and there may be people or heavy equipment in the road. Be alert at all times for these changes. This is the number one way to reduce the possibility of being involved in a deadly construction zone accident. If you are injured in an accident by a negligent driver, it is important to know your legal rights. You have a right to collect compensation for your injuries, for damages, and for pain and suffering. But without an experienced Colorado Springs lawyer on your side, this is often difficult. Contact the experienced Colorado Springs car accident attorneys at the Green Law Firm today to schedule a no-obligation consultation and discuss your case. Call us today at 1-719-694-8515.